Search Our Inventory / All Rugs / 10&apos; 2" x 13&apos; 6"
10&apos; 2" x 13&apos; 6"
This carpet's celebrative and inventive design, subdued tonaliteis and antique ivory field is meant for memorable use in a fanciful, upbeat room. Displaying the prized botanical Mustafavi pattern depicting a wreathed �Garden of Paradise,� glowing golds, rich celadon, Prussian blue and softened rose, dance in a careful assemblage across the virtually never seen ivory background. 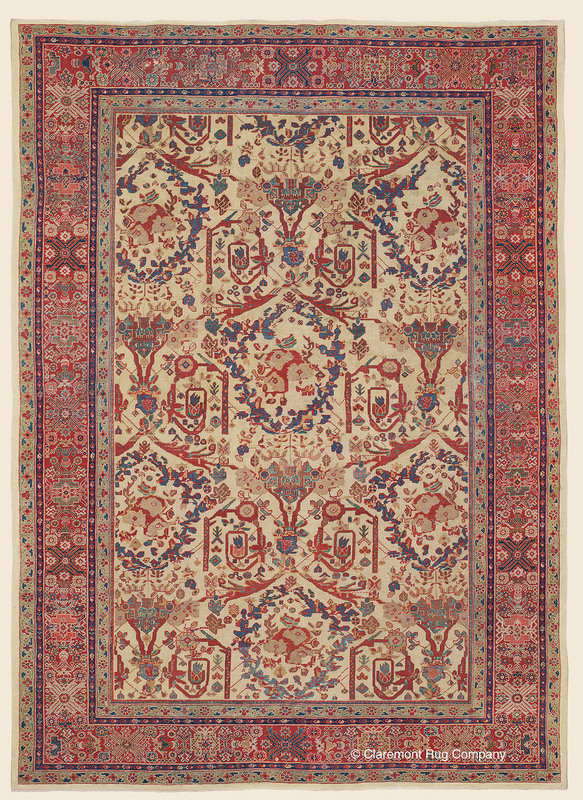 In counterpoint to garland imagery of the field, its exceptionally intricate geometric main border introduces one of Sultanabad�s signature border designs. This beguiling, interlocking sunburst patterning is supported by an exquisite warm hued base.